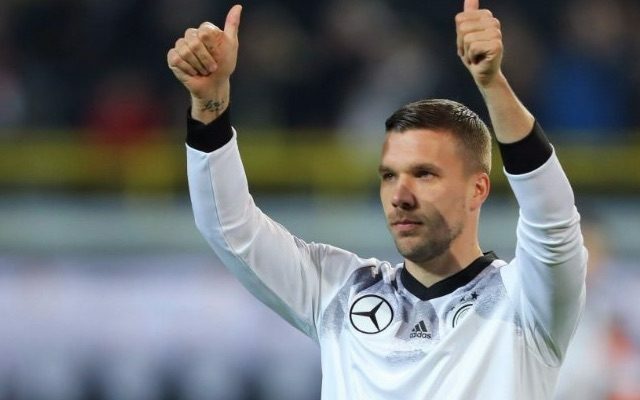 The international career of Lukas Podolski comes to an end after tonight’s friendly between Germany and England. But the former Arsenal striker was seemingly keen to prolong his Germany career for as long as possible, as he delayed kickoff in Dortmund when his speech overran. Kickoff was originally planned for 7.45pm, but Podolski’s relentless nattering meant the game could not get underway until 7.53pm. Podolski is a popular character and the thousands of fans inside Dortmund’s Westfalenstadion arena seemed to enjoy his public address. The 31-year-old won his 130th senior international cap tonight. His Germany career saw him reach the business end of three World Cups, winning one and finishing third twice.